Milwaukee Road E32A, South Tacoma Shops, April 11, 1965. The beginning of the end crept silently into the Electrification Department. With no monies budgeted for new electrics, the process of scavenging parts off of dying locomotives to keep remaining units on the Road began. This was a sorry sight to see. E32A has already been stripped of her pantographs and front motor set. The death of a locomotive is sometimes very obscene. When they are being erected, everything is new, bright and shiny and there is an air of excitement. The end generally begins with neglect. A sad ending for locomotives that had for almost 50 years, been dragging revenue over the Pipestone and Cascades. There is a story told of one such consist pulling on more than her share. Helpers were denied. And so she groaned on into the night at barely a walker’s pace, completing her assignment without a whimper. When they die, it is on some out of the way team track, with doors hanging open, gaping wounds, and rusting car bodies. In 1964, 13 units were escorted to the back lot. The year I took this photo, 16 units met a similar fate, and by 1970, only 31 of the original 84 units were still roadworthy. In the end, E32A became home to a bird family. The nest could be viewed as an affront to her death, or a symbol of life after death. 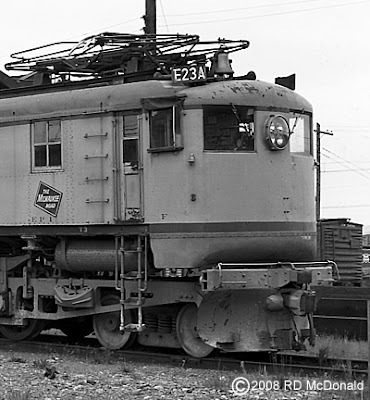 Railroad Stuff: E32A, AlCo (car body) GE (electronics) Class EF-5, 3,000 hp. Built 10106A 10/11/1916. Renumbered 10236A 5/31/1920. Renumbered 10509A 2/27/1936. Renumbered E32A 3/9/1939. Renumbering information from “Milwaukee Road Motive Power” compiled by Sy Reich, Railroad Magazine, October 1960. 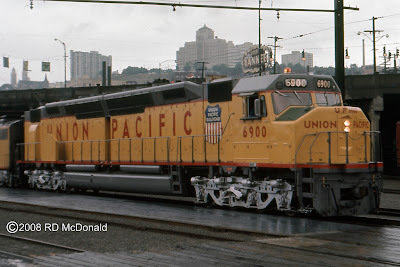 Union Pacific 6900, Seattle Washington, June 24, 1969. 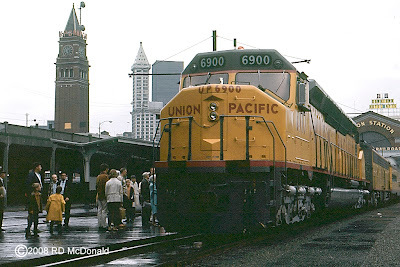 Despite a gloomy rainy day in Seattle, crowds came down to Union Station to see what the Seattle P-I heralded as "The World's Largest Locomotive", built at a cost of $500,000! Check out the kids to the left. UP 6900 was touring the West as part of UP's Centennial celebration. The 42 story Smith Tower, white building in background, was at one time, the tallest building west of the Mississippi. The clock tower is King Street Station. 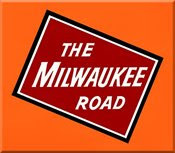 The Milwaukee Road’s electric trains used the canternary above the Centennial. 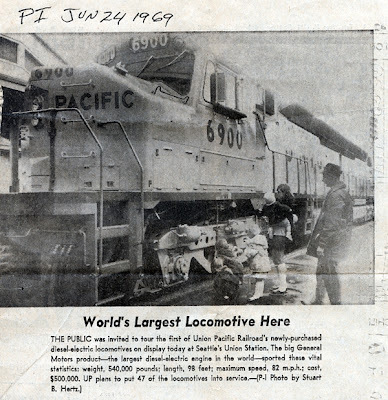 In 1969 UP purchased the very largest and most powerful diesel ever built, the DDA40X, with 6,600 HP provided by two diesel engines (prime movers) mounted on one frame. These 270 ton, 98 foot long behemoths were built by the Electro-Motive Division of General Motors Corporation. The "Centennial" was named to honor of the 100th anniversary of the "Driving of the Golden Spike Ceremony” on May 10, 1869. 47 units were purchased, numbered 6900-6946, beginning in May of 1969 with deliveries continuing through 1971. They were numbered using the "6900" series to mark the '69 dates. 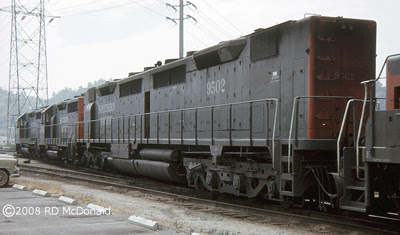 The "Centennials" were designed for high-speed freight and by 1980 had successfully run up an average of 2 million miles a piece. With the decline of freight movement in 1980 the fleet of DDA40Xs were taken out of service and put in desert storage at Yermo, California. In March of 1984 an economic recovery brought a demand for more motive power and 25 were returned to service. However, high maintenance costs caused the retirement of most of them by the close of 1986. My late wife and I saw the 6900 at North Platt Nebraska in 1989. Since then, she was moved to Omaha, the site of an integrated Union Pacific Museum. 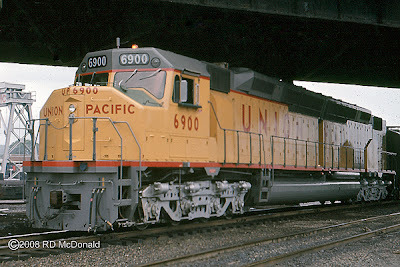 Railroad Stuff: Union Pacific Railroad 6900, General Motors DDA40X, 6,600 horsepower, built EMD April 1969, serial number 34526, retired Jun 25 1984. Donated to Omaha Nebraska, November 1986. Welcome to Covington and a pure adrenalin rush! That’s the only way to describe the assault on the senses, as a squadron of V-16’s – five covered wagons and a geep all in Run 8 - roaring me by less than 30 feet away! I could feel the motors pounding in my chest! Pure Raw Horsepower! Following the “North Coast Limited,” this freighter had departed Auburn and immediately leaned into a steady eastbound climb from East Auburn, a bump of 1.3%, and past us here, .51% up to the Green River Reservoir, where the profile leveled out along the reservoir, allowing her and her sisters to catch their breath. Then “Boom” into a grinding winding climb, with a maximum of 2.2% up to Stampede Pass, heading toward St. Paul. This was railroading! I am truly blest to have experienced this generation of motive power! Railroad Stuff: Northern Pacific Railway 5409D, FT-A, 1350 hp, built EMD 1945, serial number 2842, traded by Burlington Northern to EMD for an SD45 in June, 1970. Western Pacific Railroad 805D, Oakland California, November 27, 1960. I was all of 17 when a family visit to California over Thanksgiving led to me finding this gem! 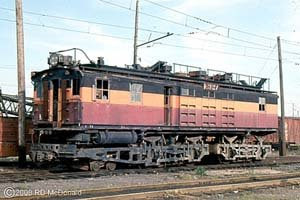 This unit was purchased to power Western Pacific's “California Zephyr” – The California West Wind – between Salt Lake City and Oakland, from March 22, 1949,until March 22, 1970. 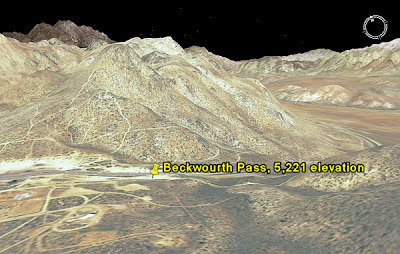 The Western Pacific Railroad ran 930 miles of steel from Salt Lake City over Beckwourth Pass, through the famous Feather River Canyon, terminating in Oakland. A Scotsman and surveyor named Arthur W. Keddie hung his shingle out at Plumas, California. He was hired to survey a wagon road across the Sierra through Beckwourth Pass, named after a mulatto scout who found the pass in 1850. Keddie was elated at “finding a crossing of the Sierras with grades too easy to waste on a wagon road!” Beckwourth Pass, at 5,221 feet, was a full 2,000 feet lower than Central Pacific’s 7,085-foot Donner Pass! Keddie had a number of false starts, but finally found the money and power he needed to finance his dream, and in 1903 incorporated with George J. Gould, financier and philanderer. On November 1, 1909, the Last Spike was driven at the Keddie, named in his honor. After the demise of the “California Zephyr,” she ended up in freight service. You can see her now at the Western Pacific Railroad Museum at Portola, California. 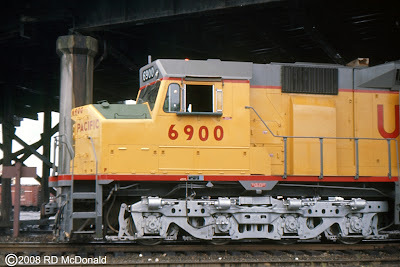 Railroad Stuff: Western Pacific Railway 805D, General Motors FP-7, 1,500 hp. Built EMD 1950, serial number 9004. Trade-in to GE; Sold to Wellsville Addison & Galeton; then to Louisiana & North West 49; then to Feather River Rail Society, 1987. 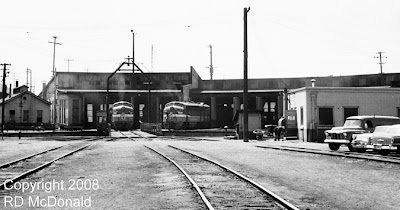 OWR&N 900309, Albina Yard, Portland Oregon, December 6, 1959. Most railroad photographers aim at the “stars,” – locomotives – with the thrill of the chase, the nailing of a specific motive power, and perhaps building up “roster shots” of their favorite locomotives. But there is a whole bunch of candidates for “best supporting actor” – MOW - Maintenance of Way equipment that enable the “stars” to shine, sometimes overlooked! I was 16 years old when I took this photo. On a trip to Portland to visit friends, the visit predictably turned into a rail photo shoot at Albina and North Portland. Still bearing the name of Union Pacific's early incursion into the Pacific Northwest, we found an Oregon Washington Railroad & Navigation big hook at Union Pacific’s impressive brick engine shops at Albina. As I understand it this is an Industrial Brownhoist oil-burning derrick, built in August 1926; capacity of 160 tons. Industrial Brownhoist was located in Bay City Michigan. Click on the "GO Industrial Brownhoist" button, located just above the upper left hand corner of the plant photo, to see a fantastic slide show of IB builders photos! An employee later lamented that he knew the end was near when he watched Japanese visitors taking pictures in the plant, which closed in 1983. Great Northern Railway 1147, 2-8-0 Class F8, Wenatchee, Washington, August 7, 1956. I was 14 when I took this photo. We were on a family vacation to eastern Washington to see the Rocky Reach Dam construction site. 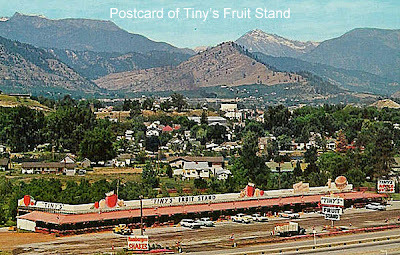 And of course, no trip over the mountains was complete until you made your way to “Tiny’s” fruit stand in Cashmere, for aplets and cotlets. Of course Richard “Tiny” Graves was the main attraction, a delightfully massive man in his signature white short-sleeved shirt, covered in – what else – apples! Now imortalized in a book written by his sister, "Tiny, King of the Roadside Vendors!" This doughty Consolidation was presented to the City of Wenatchee in dedication ceremonies on June 2, 1956. It is still on display (at least as of 2006) at Wenatchee City Park. It’s always a bit disappointing to have to contend with a chain link fence to admire a machine like this. Unfortunately it is the only way to keep the display from being “parted-out.” And as we saw in “Static Display #1” even being behind fencing does not always guarantee it’s safety. "This memorial to the "Iron Horse" of the era of steam-engine no. 1147 was given to the City of Wenatchee by The Great Northern Railway Company to serve as a symbol for generations to come of the tools which developed an empire. Designed for service on steep grades, this consolidation type locomotive was built by Rogers Locomotive Works in 1902, the first of a series by that builder for The Great Northern. It is a G.N. class F-8 with a 2-8-0 wheel arrangement, and was one of the last steam engines on The Great Northern rails in the Pacific Northwest. No. 1147 did its first duty between Leavenworth and the Columbia Basin soon after delivery. It was assigned to Wenatchee between 1916 and 1948 and hauled the longest train for its class over the Wenatchee-Oroville branch. The 78 foot section of track on which it stands duplicates in every detail the standard Great Northern main line track of 115 pound steel, fully tie-plated, spiked and anchored on creosoted ties imbedded in 24 inch crushed rock ballast. This engine and tender were moved to this site on May 21, 1956. No. 1147 and tender weigh nearly 129 tons. 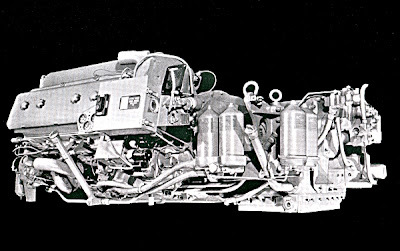 Engine and tender are 69 feet 8 1/2 inches long. Height from rail to top of stack is 15 feet 4 inches. Originally a coal burner it was converted to oil in 1913." Great Northern 1147, Consolidation, 2-8-0, built Rogers Locomotive Works, 1902. 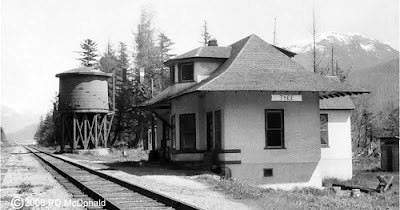 Canadian National Railways, Tyee Station, Mile Post 92.8, Skeena Subdivision, August 7, 1958. Steam locomotives needed water to survive. So that's why many, if not most, stations on subdivisions were located on or near dependable year 'round water sources such as lakes, rivers, steams, creeks, or springs. To keep that water tank full, Tyee Station was located near the Ecstall River, where she flows clear and cold from the Coast Range Mountains into the mighty Skeena River. More than 400 of these “Type E” stations were scattered across Canada. "Type E" is a designation assigned to CNR Floor Plan 100-152, by Charles Bohi in his books Canadian National's Western Depots (1997) and Canadian National's Western Stations (2002). The Grand Trunk / Canadian National Railways did not assign this designation. Almost all were built on the north side of the track, when alignment permitted, to take advantage of the sun to warm the un-insulated waiting room. Tyee is an exception, located on the south side of the main. This view is looking to the east up the Skeena River. The Train Order Paddle is up, and the station is unmanned. The transition to diesel marked the beginning of the phase out of these stations. Indeed, most were burned to the ground in the early 60's. Canadian Pacific Railway 8409 Spence’s Bridge, MP 72.8, Thompson Subdivision, November 1959. Originally called Cook's Ferry after Mortimer Cook who ran a raft style cable ferry across the Thompson River, it was later re-named after Thomas Spence. Spence, a Royal Engineer and road builder, won the contract to build a bridge across the river to replace the ferry during the construction of the Caribou Wagon road. The bridge then became known as Spence's Toll Bridge. 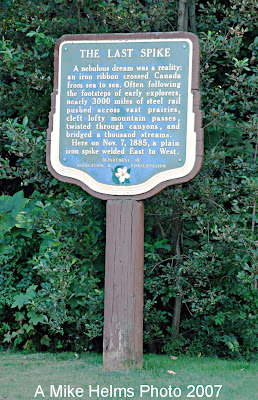 The site of the Last Spike of the Canadian Pacific Railway is located on Highway 1, approximately 10 miles north of Spence’s Bridge on the east bank of the Thompson River, at Craigellachie, British Columbia on 9:22 am November 7, 1885. 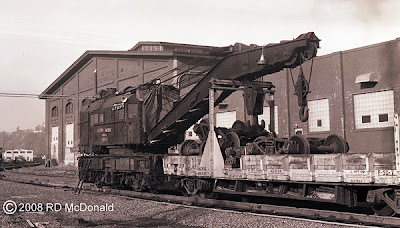 Railroad Stuff: CPR 8409, GP-7, 1,500 hp, GMD London Ontario 2/52, sn: A325. 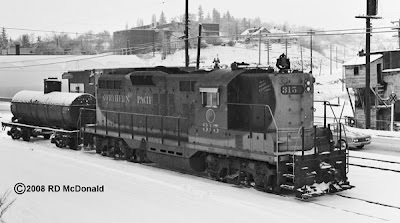 Rebuilt at Ogden Shops to 1,750 hp GP-9u CPR 1501, 1980. 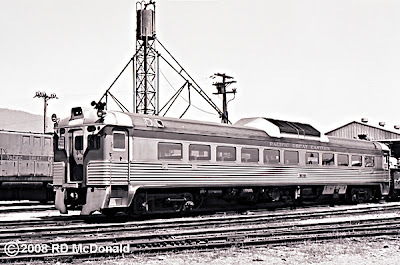 CPR 8417, GP-7, 1,500 hp, GMD London Ontario, 3/53, sn: A504, Rebuilt at Ogden Shops to 1,750 hp GP-9u, CPR 1506, 1981. Union Pacific Railroad, Northwestern District, Oregon Division, Tekoa – Ayer Subdivision, September 18, 1962. The Union Pacific covered eastern and southeastern Washington like a spider web, tapping into the richness of the Palouse country, world renown for its wheat, pea and lentil crops, and reaching into Idaho for her timber. Compare this map with a current map of short line activity in the Palouse Country. I got a shot of northbound #392, with UP 224 and UP 517B, hauling revenue thorough the tiny farm community of Colfax at Mile Post 77.3. This was all train order country, with an extra layer of protection afforded by a short block signal area just south of town, were the Great Northern Railroad Mainline crossed the UP. Double clicking on the map will yield an interesting look at how the “Red Dots” were connected! 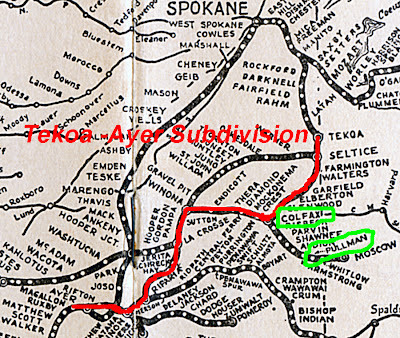 I traced a red line along the Tekoa – Ayer Subdivision snaking 116 miles through the fantastic rolling hill of the Palouse Country. Take a look at the Tekoa link. Toward the bottom of that page are a group of interesting shots of the Union Pacific round house that used to exist there, and in the background, a massive trestle under construction, carrying the Chicago, Milwaukee, St Paul and Pacific flying over the Union Pacific tracks, and a whole lot more! And Ayer? Little more than a siding with a few inhabitants residing on the Snake River in the literal middle of no-where. 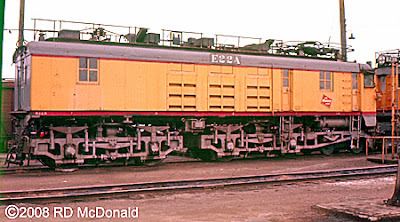 Union Pacific 517B, Built GM F3, 1,350 hp, nee UP 1509, renumbered UP 1454, rebuilt F9A, 8/58. Southern Pacific 9502. Taylor Yard, Los Angeles, California, August 6, 1967. Consider the ubiquitous “B” unit. Never quite achieving the status of an "A" unit, always in back, tagging along. But when the tonnage rating gets iffy, and we need a boost, who better to fill the bill? So here's a toast to the utilitarian "B" unit! In this case - a BIG B unit! Drove down to LA to visit friends. They said they had a treat for me and took me to Taylor Yard. I was thrilled, having heard how impressive a yard it was. When we got there, the first thing I saw was this big ugly box – DD35. But things went down hill fast. Moments after I shot this big ugly box, a station wagon comes roaring up, and this fellow announces he’s an SP special agent, we are on private property and we are to get back in our car and leave. Definitely a first for me. Even in the Bay Area, I never had a problem wandering around with my camera at either South San Francisco, East Oakland, or even at the Western Pacific facilities. Only two roads ordered this unit. Union Pacific had 27 of these big boxes; the Southern Pacific had but three of these monsters, so I felt lucky to have at least seen it at 1/250th of a second! Pretty tough finding out info on these three units. 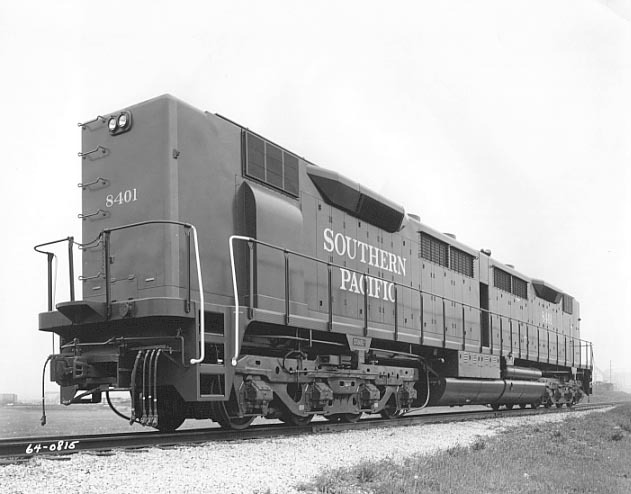 Railroad Stuff: SP 9502, DD35B, 2 x 2,500 hp 567D3A, built 4/64, scrapped 1978. Canadian Government Elevator, Prince Rupert, 1958. Opened for business in 1926, this elevator had a capacity of 1,250,000 bushels. CNR 1274, an SW1200RS, is arriving from Terrace, having dropped off the log cars at Port Edward, some 10 miles s.e. of town. 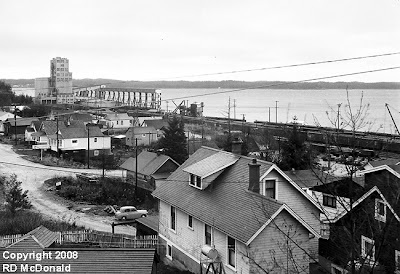 For many years the elevator in Prince Rupert was only used as an “overflow” facility, with the bulk of grain being shipped out of Vancouver. 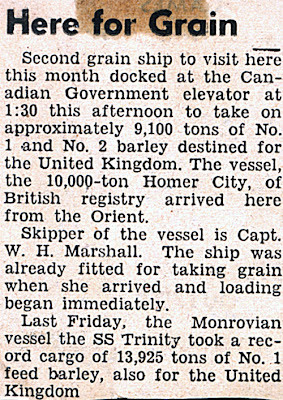 Indeed, between 1937 and 1951, there were only nine shipments, a total 63,000 tons loaded! 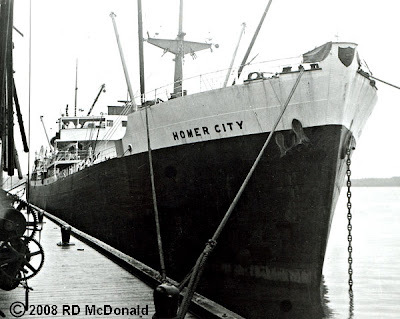 During the period we lived there – 1957 through 1959 – there seemed to be at least a ship a month as I recall. Many ships that called in Prince Rupert were brand new vessels on their maiden voyages from the shipyards of Japan. 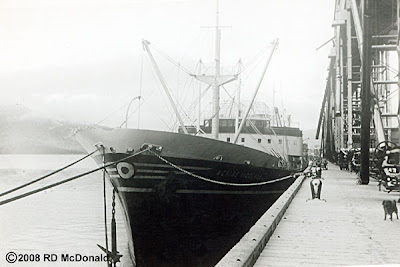 The “M/V Achios Nicolaos,” also on her maiden voyage, ready for loading on a cold day in December 1957. My sister and I would board these vessels and prowl around, always immensely interested in those powerful engine rooms. Few paid attention to us, and several times we’d bring crew home for dinner. My parents were a Welcome Wagon committee, and we loaded the crew members with newspapers and magazines to take back to the ship! 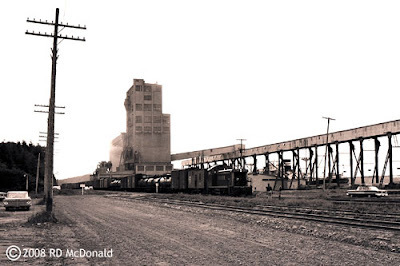 In 1970, a consortium comprised of United Grain Growers, Cargill Grain and Pioneer Grain took over operation from the Canadian Government, and in 1987 the facility was dismantled. 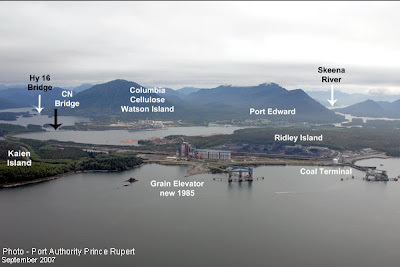 A new grain elevator opened at Ridley Island in 1985 some 10 miles from Prince Rupert. 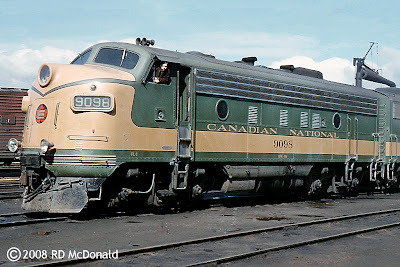 Canadian National Railways 9098, Prince Rupert BC September 1958. CN classified this unit as a "GFA-15d;” General Motors, Freight A, 1500hp. 4th order of this group. However, she was built as class V-1-A-d. Now that one I’m not sure of! The Canadian National Railway pioneered the use of ditch lights about 1955 or '56. Not offered as a factory option in those days, light were bolted to the nose of cab units. Beams cross over 50 feet ahead of the engine. This gives a "round the corner" effect. While the crews did not appreciate the lack of slide protection provided by the cab units, you've must admire this livery. Oh. By the by, that's me, a mere lad of 15 hanging out the window! Railroad Stuff: Canadian National Railways 9098, GMD F7A, 1500 hp, London, Ontario, 11/52, sn: A-385, retired 7/75, scrapped at Transcona, Manitoba. When conducting my research for my blog articles, I occasionally run across web sites that are above average, present solid information, have clear photographs, and no dead links, which indicate to me that they take pride in their presentations, that I will recommend to you. 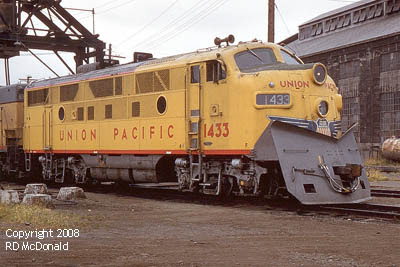 Union Pacific 1433. Argo, Seattle, July 15, 1961. Four rectangular and two porthole openings along with chain link fencing, are the hallmarks of the early “Phase II” F3’s. 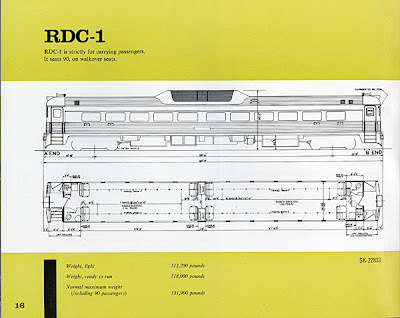 Although General Motors Division never referred to “phases” in their catalogs, locomotive enthusiasts created the “phases” to mark the progression of models. UP 1433 sports the annoying single blat air horn, mark of a true basic model without white-walls or power steering! Note the grab handle under the windshield, but how does one get to it? Apparently a ladder with hooks! And the plow is definitely designed not only for serious snow removal, but also for flicking VW’s out of the way! Railroad Stuff: UP 1433, EMD F3, 1500 hp 567B motor, built 3/1/48, sn 4638. 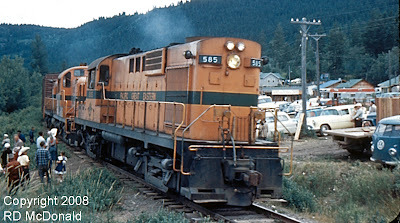 Pacific Great Eastern 585, Mile Post 314, Williams Lake, June 1958. It’s Rodeo Time in Williams Lake, and I’m listening to one of the longest horn blasts I’ve ever heard – about a 10 second blast, as the rodeo crowd is parted. Williams Lake, like so many Interior outposts, traces its beginnings to the early fur trade and British Columbia’s gold rush. Later came ranching, and with the building of the Pacific Great Eastern, Williams Lake became an important hub and railroad division point. Here we see southbound Third Class freighter #25, blasting her way through the crowd at the Williams Lake Stampede, an annual event celebrating the heritage of the Cariboo Country. Williams Lake was the division point between the Prince George Subdivision to the north, and Lillooet Subdivision to the south. 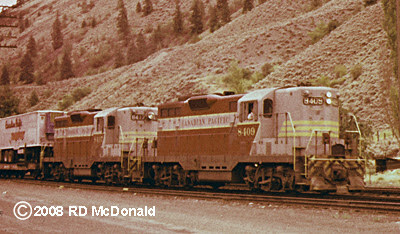 PGE owned eight of these RS-10’s, which were the Canadian version (MLW) of the ALCo DL-700. Pacific Great Eastern sister locomotive number 586 is on display at the Prince George Railway & Forestry Museum in Prince George. Railroad Stuff: PGE 585, Montreal Locomotive Works, RS-10 (ALCo DL-700) 1,600 hp. Became BC Rail 585 in 1972, retired in 1972. Prime mover 4 cycle Model 244G V-12. 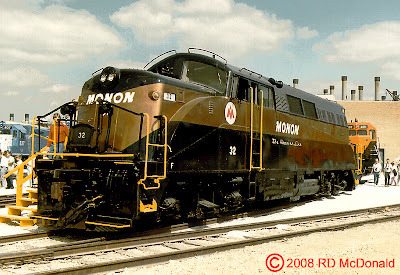 Montreal Locomotive Works built a total of 128 RS-10’s for PGE and other Canadian Railroads, from December 1954 and February 1957. For other articles relating to the Pacific Great Eastern at Williams Lake, go to “Labels” and select “Williams Lake.” Or, type in “Williams Lake” in the Google search box for this site. 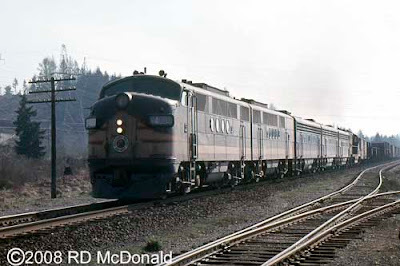 Northern Pacific 5406D, Auburn, January 6, 1962. It’s a cold, wet afternoon in Auburn, where I found 5406D-C-B-A fueled and sanded, awaiting assignment. 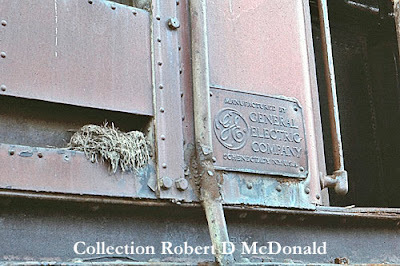 Northern Pacific track gangs arrived here in 1910 and over the next three years, constructed a classification yard, 25 stall roundhouse and shops, and auxiliary trackage for cabooses, RIP, and locomotive servicing – coal and sand. “Electric Lights on All Trains!” The May 13, 1918 Tacoma Daily News proclaimed: “Four Trains Each Way to Portland. Three Daily to Aberdeen-Hoquiam. High-back Seat Coaches, Observation Cars, Dining Cars on Day Trains. Coaches and Standard and Tourist Sleeping Cars on Night Trains. 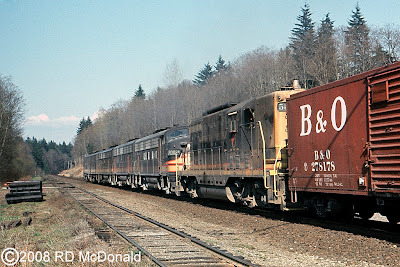 Northern Pacific, of course, lost its identity in the “Big Merger.” Burlington Northern Santa Fe closed all Auburn faculties in 1986, ending a long relationship between the City of Auburn and railroad, which, during the halcyon days of railroading, employed as many a 600 employees! Flying over the area on “Google Earth” we can discern the ghosts of the roundhouse, yard office and shops. 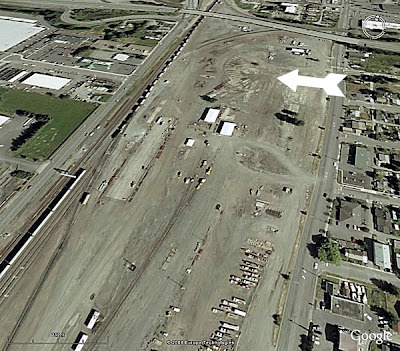 The arrow points to the Ghost of the Roundhouse, and it's obvious most of the classification yard has been torn up. Railroad Stuff: Northern Pacific 5406D (A+B+C+D) FT-A, 1350 hp, built EMD 1944, sn: 2564. Traded to EMD for an SD45 in 1968. As a young airman stationed at Kessler AFB in Biloxi Mississippi, the lure of the Big Easy was undeniable, if you know what I mean! It was just a few bucks on a Greyhound for a young man from Seattle to be prowling around a one-of-a-kind city. 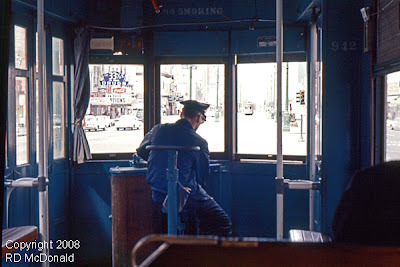 Here I capture Canal Street 02, car number 942, rumbling along at the mandated maximum speed of 10 miles per hour. The Canal Street line’s history dates back to 1861. Built by Perley A Thomas in 1924, Car Number 942 was terminated with the line in 1964. The line was reinstated in 2004. Then came Katrina in 2005. Perley A. Thomas Car Works, Inc. named for its founder, was a 20th century builder of wooden streetcars, based in High Point, North Carolina. 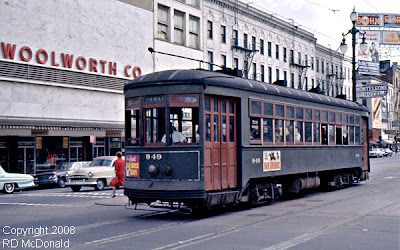 The company built many of the wooden electric overhead-trolley powered streetcars used throughout the United States primarily in the first half of the 20th century. Famous for their workmanship and durability, some of the cars built by Perley A. Thomas Car Works in the early 1920s are still operating today in New Orleans. The Perley A. Thomas Car Works was reorganized as Thomas Built Buses, Inc., and became one of the three principal builders of large school buses the United States. It is still based in High Point, and is now part of the Freightliner Corporation in Portland, Oregon (where I was employed as Media Supervisor for seven years) which was recently renamed Daimler Trucks, North America. The wide destruction wrought on the city by Hurricane Katrina in September 2005 knocked all three lines out of operation and damaged many of the streetcars. Service on a portion of the Canal Street line was restored in December of that year, with the remainder of the line and the Riverfront line returning to service in early 2006. As of December 2007, the entire St. Charles line through service has been restored – with the Perley A Thomas cars still in service!